The mention of alchemy suggests a conjurer’s art, where base metals are transmuted into gold, and elixirs bestow everlasting health and life. This was indeed part of the alchemist’s aim, but practitioners often had great practical experience and skill in experimentation too. And it is in some of the earliest ‘scientific’ laboratories that these experiments would have been carried out. 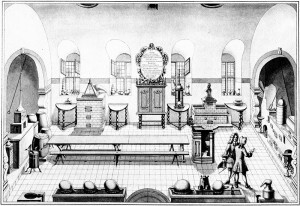 Some sense of the likely appearance of the Ashmolean laboratory can be gleaned from this engraving of the laboratory at Altdorf University, founded at exactly the same time. From Johann Georg Puschner, Amoenitates Altdorfinae, 1720. 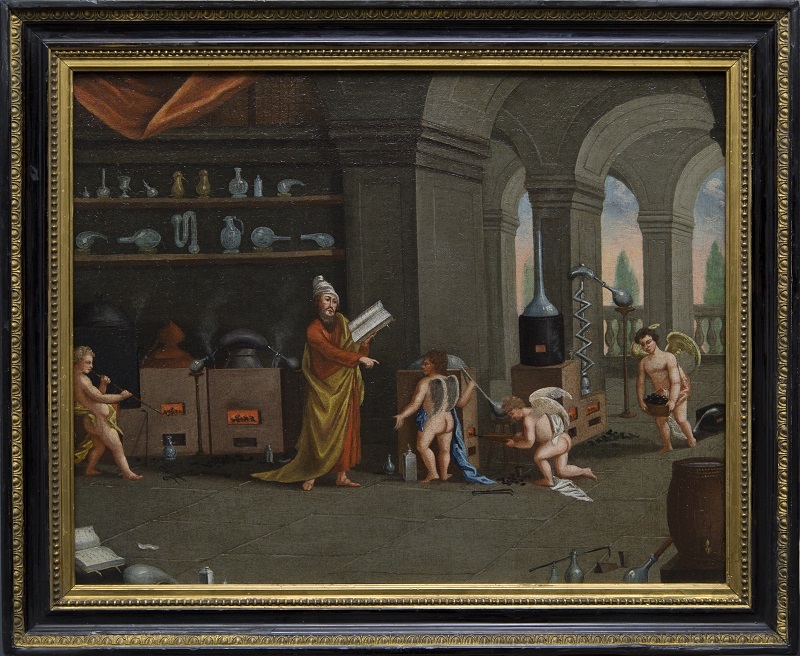 Early representations of alchemical laboratories show them as places where both knowledge and manual work were combined. The 17th-century oil painting above, from the Museum’s collections (inv. 99027), depicts such a workspace. The picture has recently been conserved thanks to the support of the Woodmansterne Art Conservation Fund, so we’ve taken the opportunity to display it in our Basement Gallery along with a few other alchemical items from our collections. In fact, the Museum’s Basement Gallery itself has its own place in the history of alchemy and early chemistry. The building was opened in 1683 as the original home of the Ashmolean Museum and the lower level was its basement lab at a time when there was no clear distinction between alchemy, chemistry and ‘chymistry’, so it is an appropriate venue for the Alchemy and the Laboratory displays. As with many other words beginning “al-“, the term alchemy comes from Arabic. 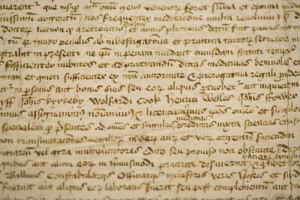 Medieval European alchemy was largely derived from Arabic treatises on the subject. 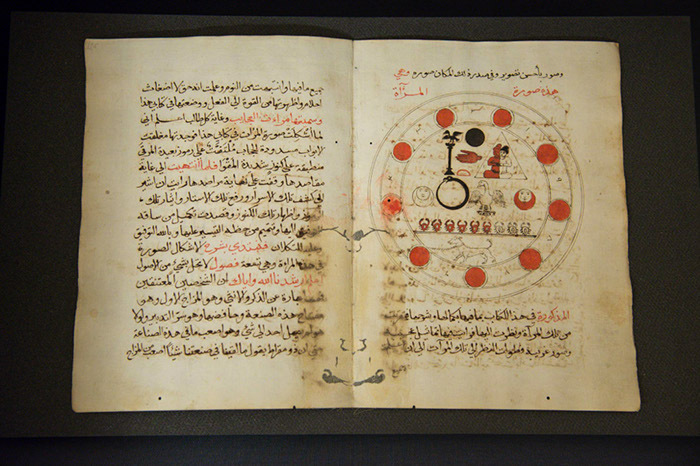 The Museum has a small collection of Arabic alchemical manuscripts, including the illustrated leaf shown below. But perhaps one of the most remarkable alchemical items in the collection is a manuscript dating from 1456, during the reign of Henry VI. 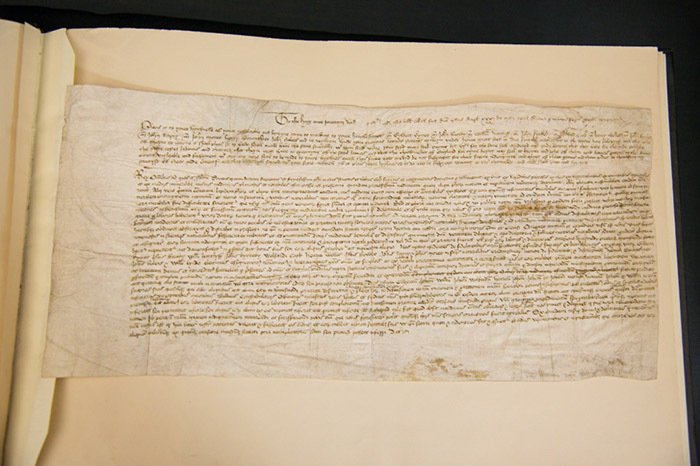 It is actually a petition to the crown, asking for permission to practice alchemy at a time when it had become a criminal offence due to concerns about the value of money if base metals really were transformed into gold. Of the twelve petitioners – who included important ecclesiastical, academic and court figures – just three were granted a licence, although it is not clear why. Alchemy and the Laboratory is on display in the Museum’s Basement Gallery until 7 June 2015.